As it does each year the 62nd PGA Merchandise Show provided an opportunity to see lots of innovative, interesting and useful products…and as is often the case an overall feeling of optimism concerning the state of the golf business was not uncommon. The Show, called “The Major of the Golf Business” open only to industry members, ended last Friday Jan. 23 with more than 1,000 companies having exhibits taking up 1 million square feet in Orlando’s Orange County Convention Center. Just over 200 exhibitors were new to the Show and comments from first timers were typically upbeat. 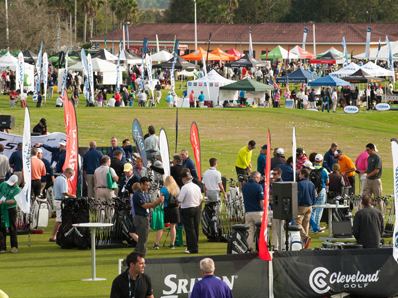 New and improved products are the life blood of any industry but for golf a more significant sign was the healthy increase in attendance by the sometimes unsung people on the front line, PGA of America Professionals. According to Reed Expositions, the company that runs the Show, six percent more PGA Professionals made the trip to Orlando than last year while overall attendance was up one percent to over 41,000. Those walking the ten miles of aisles and attending the educational seminars came from all 50 states and 79 countries with the top five (outside of U.S.) being Canada, United Kingdom, Japan, Korea and Sweden. A concerted marketing campaign to grow the number of PGA Professionals and key buyers attending the PGA Show, created a more valuable business-to-business environment. Put simply, there were more qualified buyers on the floor to impact exhibitor business. Also a positive sign was the nine percent increase, to over 7,000, attending the Outdoor Demo Day on Tuesday Jan. 20 restricted to invited golf retailers and media at Orange County National Golf Center in nearby Winter Garden, Fla.
No one believes everything is rosy for golf industry sales and profit prospects given the continued slide in golf participation but it is encouraging to see at least some positive signs as reflected in this year’s Show attendance.